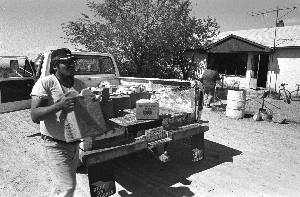 "Delivery from the distribution center on the Ute Mountain Indian Reservation in Towaoc, Colorado, June 1980." Photo courtesy of the National Archives and Records Administration and is licensed under CC BY. 1974 Confederated Ute Indian Lands. New York: Garland Pub. Inc..